Before you decide to purchase or add on a big data analytics tool, you must identify your organization’s specific needs and match them to available products. And while these tools enable you to analyze a wide variety of information – from structured transaction data to social media and other forms of unstructured and semi-structured data – the growing market for these tools is getting tougher for our members to decipher. 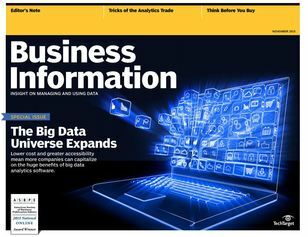 In our expert e-zine we feature an article on, Buying Big Data Analytics Tools. Here, industry expert David Loshin walks you through the buying process for big data analytics tools, why companies of all sizes now have greater access to big data platforms and how analytics tools are now less expensive and easier to use. Let us help you along the way. This can be easier. Answer a few brief questions on BI & analytics and you have immediate access to the tips. We value your opinion and your feedback is greatly appreciated.